Hey Brazilian readers, that fancy new Moto G is available to purchase right now. 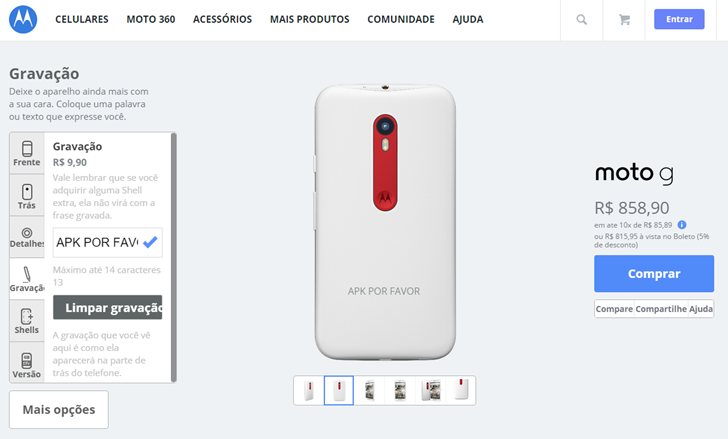 Go to Motorola.com.br if you want one - it's 849 Real for the base model. But why get the base model, when for the first time you have access to the Moto Maker cusotmization website? Motorola announced the expansion to Brazil on stage, and it looks like it's already live for the new Moto G. Go check it out. At the time of writing the Moto G 2015 is available with a white or black glass front, ten different textured plastic back colors, ten complimentary accent colors for the metal camera piece (oddly the metal side has to stay grey), and a rear engraving available for an extra ten Real. A 16GB upgrade over the 8GB base model costs 40 Real, 16GB plus a mobile digital TV tuner (not available in most other markets) costs 80 Real, and the top-end model with 16GB of storage and 2GB of RAM (and apparently no TV tuner) costs an extra 130 Real. That's 990 Real (about $290 USD) for the most expensive model with an engraving. Buyers can also select a custom boot-up greeting and set the wallpaper, though there are only a few choices (and you can always load up your own when you get the phone). The Moto X Play and Moto X Style will get Moto Maker customization when they launch in August and September, respectively, though their Brazilian releases may not be exactly in line with other markets. Happy shopping.